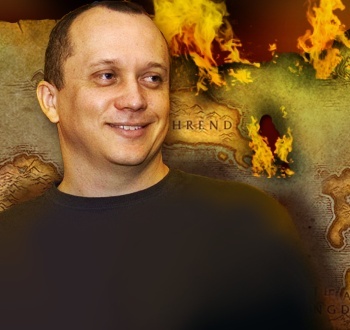 World of Warcraft lead systems designer Greg "Ghostcrawler" Street talks Cataclysm, the future of WoW, and whether any other new MMORPG stands a chance. The Escapist: Was this BlizzCon at a weird time for the WoW team since there's not really much to announce for you guys and Cataclysm? You already revealed the intro and everything. Greg "Ghostcrawler" Street: Yeah! Not only that, but we were in the middle of actually shipping Cataclysm, and there's still a lot of stuff I want to do, so it was a little awkward. "Hey, can we ... cancel BlizzCon?" and they were like, "No." TE: Yeah, "I need to be back at the office working on things." So 4.0 just came out. How have you seen the players reacting to "Everything's changing, OMG"? GS: It was crazy. We had a lot of fun logging on as soon as the servers came up, and just sitting in the cities and watching what people were talking about. Hunters talking about "Where's my Volley button?" and paladins asking "Why's my UI look so different?" It was amazing the number of players - and this probably shouldn't be amazing - that hadn't heard of any of this stuff. "They gave us no warning that this was changing!" They didn't know, they were logging in for the first time. It was crazy. TE: You say that, but do you think there was any sort of weird communication problems between the developers and the players - or are the players just not reading up on what they should be reading up on? GS: I do think there are probably communications problems. We have millions of players and not all of them read the forums or visit the news sites. We have casual players and they don't go to the news sites ten times a day like I do; they just want to go in and play the game. We should probably figure out better ways to communicate to players. We tried a lot going into this, to announce major things, but we can do better. TE: From the perspective of a player and not a developer, do you think it's odd to have the rug pulled out from under you, to have everything you're used to just change? TE: How do you think they'll cope with it and adjust? Do you expect they'll be just fine? GS: I think eventually, yes. We really tried to emphasize that change was coming. The whole theme of the expansion is change - that's what Cataclysm is all about, all this stuff is going crazy. Also, one of the things we learned was that players want something, anything to change. We had a few classes that we thought were in pretty good shape, we thought we'd solved them, and the player reaction was, "Well, I know, but I was waiting for my talent revamp, when's it coming?" and I'd be like "Dude, you're fine, you don't need it, we've fixed all these issues." We used to say change for the sake of change is a bad thing, but I think for an expansion - to an extent - that's what the players are looking for. The players want to see something different that they have to understand and learn and master. TE: So, as long as they feel like they're getting something - that isn't even a fix? GS: Yeah. Even something that's just different. "Well, we used to use this spell, now we use this spell and it least that's keeping it fresh for me after playing my mage for four years." TE: "I used to shoot blue bolts, now I shoot red bolts." GS: Yeah, sometimes that's all it takes.